Provide comfort for the family of Philip Palmiero Sr. with a meaningful gesture of sympathy. 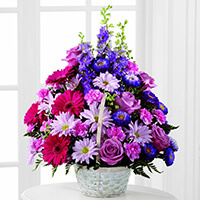 To send flowers in memory of Philip A. Palmiero Sr., please visit our Heartfelt Sympathies Store. The Mangel Family sent flowers to the family of Philip A. Palmiero Sr..
To the Palmiero family,We are so sorry for your loss.Our thoughts and prayers are with you. The Mangel Family purchased the The FTD Pastel Peace Basket for the family of Philip Palmiero Sr..